The food supply to an expanding world population is based on grain crops, i.e. crops harvested for their seeds. Therefore, understanding the process of seed growth and its regulation is crucial in our efforts to increase production, in order to meet the needs of that population. Yield is determined by the ability of crop plants to use their assimilatory processes such as photosynthesis and also the biosynthetic processes in the seed, which are partly regulated within the seed itself. 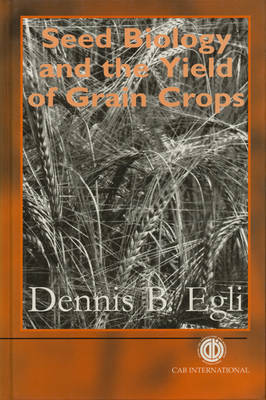 This book examines the determination of grain crop yield from a new and unique perspective, by concentrating on the influence of the seed. All aspects of seed growth and development are described, including environmental and genetic effects on growth rate and length of filling period. The effect of the seed on the two main yield components, individual seed weight and number of seeds per unit area, is then discussed. Finally, the concepts and models developed are evaluated in terms of crop management. The book is essential reading for those concerned with seed science and crop yield, including agronomists, crop physiologists, plant breeders, and extension workers. It will also be a valuable source of information for lecturers and graduate students of agronomy and plant physiology.